San Luis Obispo Landscaper Versus Gardener - What Is The Difference? One of the responsibilities that is associated with being a homeowner is taking care of your property. So does that mean hiring a San Luis Obispo landscaper or gardener? Anyone who does not work in this type of field could get easily confused by what it all means and what the similarities and differences are. At their core, both gardening and landscaping services involve using creative planning and hard work to establish and maintain a feature of your yard. Yet it helps to take a more in-depth look at both professions and discover the line that separates the two. Landscaping is in reference to visualizing the planned picture for the space and then implementing that design in order to get the finished results. This layout usually incorporates plant life but also elements such as hardscapes, fencing, fire pits, furniture or even entire outdoor living spaces, such as an outdoor kitchen. Gardening refers to the same type of creative imagery and laborious work to carry out the plan. However, the focus is on the plants alone. A gardener will plant, maintain, weed, prune, mulch, fertilize and carry out other tasks associated with establishing and maintaining the plants. So, simply put, it could be said that gardening is one element of being a landscaper. The bottom line is that it would be safe to use the terms interchangeably, however it is important to know the minor differences. If you hire a landscaper for gardening services, it is probably something they would cover. However, if you hire a gardener expecting full landscaping services, you may not be getting all of what you actually need. In all fairness, even landscapers vary on the services that they offer. While some take care of everything right down to moving your yard, others tend to steer clear of some time consuming tasks that get in the way of creative planning and implementation. 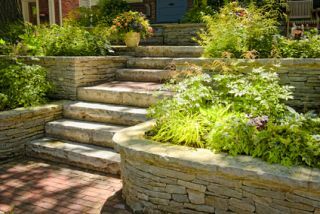 Landscaping architects require a degree in this field and must pass a national exam, in order to acquire their license. Gardening pros may have a degree in botany or horticulture, but only Master Gardeners are required to complete a masters program. By making the wise decision to call on Dan’s Landscaping Company, Inc. you can rest assured that you are getting the best of both worlds. We can provide you with a wide range of essential services, including both landscaping and gardening. Not only that, but you can feel confident that we work we provide for you will be nothing short of the best.